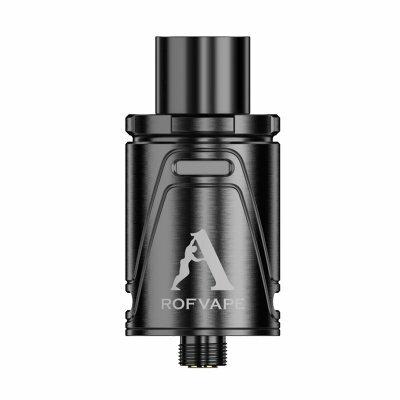 Successfully Added Rofvape DAC RDA - Fiber Freaks Cotton, 2 Coils, Double Airflow Control Rebuildable Dripping Atomizer (Black) to your Shopping Cart. Take your vaping experience to the next level with the Double Airflow Control Rebuildable Dripping Atomizer (DAC – RDA) from Rofvape. Known for delivering high-quality e-cigarettes, vaping accessories, and vaping kits – Rofvape has introduced the vaping world to numerous beautiful products before of which this highly innovative atomizer is one of the most recent ones. For those of you that are searching for a way to significantly increase their vaping experience while simultaneously adding a cool upgrade to your e-cigarette – this stylish black steel atomizer is the perfect little vaping accessory. Thanks to its detachable design, the DAC – RDA can be easily operated and cleaned - allowing you to take the most out of your vaping experience while it provides you with high-quality flavored vape for countless vaping sessions to come. Thanks to its innovative double airflow control system, this state of the art atomizer allows you to adjust airflow through turning both its top and bottom parts – letting you adjust your taste and vapor exactly to your personal liking. Additionally, this vaper atomizer also features an anti-oil splashing design, preventing the device from leaking and thus further increasing your overall user experience. What sets this atomizer really apart from its competition is that it uses a piece of cotton drained in oil to atomize your liquids. Instead of using a tank that has to be refilled with liquid oil, this atomizer allows you to drain a piece of high-quality cotton in the vaping liquid of your liking. This innovative technique does not only limit the risk of leakage but also significantly increases your overall vaping experience – providing you with the best vapor and taste experience imaginable. Built from durable stainless steel material, the Double Airflow control Rebuildable Dripping Atomizer features a stylish and sleek design. It is easy to insert into your e-cigarette and the coils can be efficiently replaced in the blink of an eye with any other type of pre-built and DIY coils out there – allowing you to adjust your vaping experience to your exact liking. From now on you’ll be able to enjoy your e-cigarettes like never before as, with this atomizer added to your vaping kit, you’ll be treated with flavors and vape like no other e-cigarette could possibly provide you. The Rofvape DAC-RDA comes with a 12 months warranty, brought to you by the leader in electronic devices as well as wholesale electronic gadgets..